For the past few years, the Kalamazoo Nature Center has done a 5k race for Earth Day. The proceeds from the race then go to the Nature’s Way preschool associated with the Nature Center. Since my daughter attends the preschool, I thought it’d be nice to help with the race this year – and well, I enjoy being outside. In addition to the 5k, there’s a Raccoon Run for the kids – 1k run/walk. My daughters had never done a fun run before and I was excited for it! After getting up early and running 15 miles, we loaded up in the family truckster and headed over to the Nature Center for some fun. My 4yr old was super excited when we got there, running around like crazy, but wasn’t really into wearing the bib. The 2yr old wasn’t really into it at all. The excitement ended when we saw a person dancing in a gazelle costume. For some reason it freaked out my kids – even though it was one of my daughter’s teachers inside. They didn’t want to start because the gazelle was at the starting line. Once I finally convinced them to walk on the other side of me from the gazelle, they did start. But because the oldest was scared, she just wanted to walk super close to my side and not let go. I did tell her the gazelle was chasing us at one point – that made her run, and fast, until she figured out I was teasing her. We had fun though. I enjoy spending time outside with my girls regardless the activity. After Raccoon Running walking, the girls headed home and I went to help with the 5k. I was assisting w/finish line duties. It was easy, I helped pack up the start flag, unpack the finish flag, and then stood on the hill about .25mi from the finish directing the runners back to the start line – and cheering. Loudly. This entry was posted in Family, Training and tagged family, race, volunteer on May 6, 2016 by darkskyrunner. 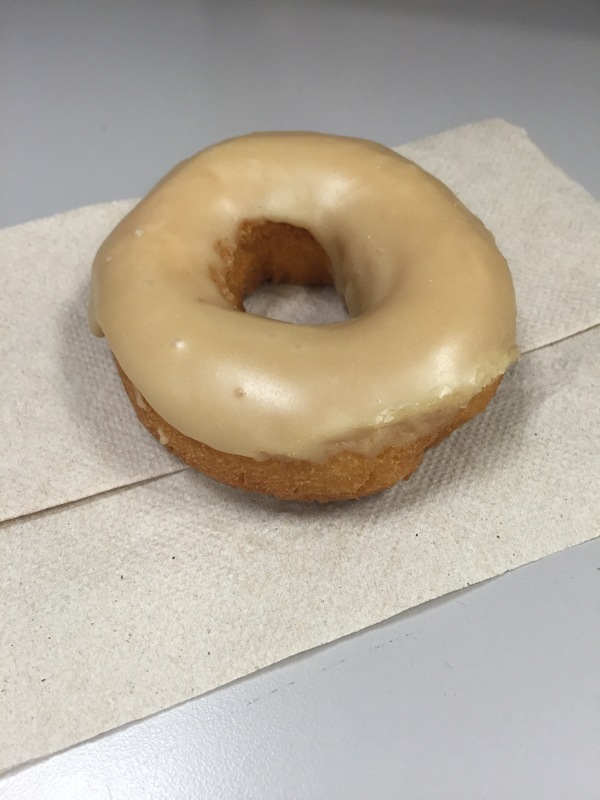 Ultrarunning requires mental toughness – so I’m training the mind by staring at this donut all day without eating it. This entry was posted in Training on May 3, 2016 by darkskyrunner. Not gonna lie – it’s been a tough few months of running. The year started with a bang when I ran really well in the Yankee Springs Winter Challenge 50k. It’s since fizzled. Life happens, it’s all good, you push through work, being ill, whatever, and get back to running as time permits. As I’ve stated on the blog before, I love to run, but on the list of my priorities, it falls below family and work so sometimes I run into stretches where I don’t get out as much as I want. In any case, I found myself a bit frustrated this morning. It was a short run (4 miles), I was running slower than I’d like, my knee kinda hurt, and I was generally bummed that I wasn’t where I should be with my running – especially with my first 50 miler coming this summer. I thought about how I’m not running as fast, or as far, or as often as many others who’re training for similar races. I follow some pretty stout athletes on twitter / strava / wordpress (I’m likely looking at YOU! ), in part to keep me motivated and in part to learn something. The downside is – when they’re crushing it, and I’m not, it can be a bit of a downer. Then I remembered … I’m not running their race. I’m not running their training run. I’m not running their pace. I’m not running for them. I’m running for me, and for my race. That’s what’s important. And as long as I’m doing the best I can at any given time, it’s all good. If you find your self in a similar mindset, remember – it’s YOUR run! So with that, here’s a picture from MY race, the Marquette Trail 50k, to remind me of what I’m headed back to this summer for 50 miles. In other news, @henryhoward wrote a cool article on my WSER goal – check it out, he did a great job! This entry was posted in Family, Goals, Racing, Training, Western States on April 14, 2016 by darkskyrunner. Out the door, down the driveway, start the watch, run … I reach up to my headlamp and click – I’m instantly swallowed by darkness. And I love it. A few months ago, on a whim, I turned my headlamp off mid run. There was supposed to be a meteor shower that morning and I wanted to see some shooting stars. I felt distracted by the headlamp so I turned it off. I instantly noticed a sky full of stars and it was awesome. I saw two shooting stars that morning – not as many as I’d hoped, but these were the first two shooting stars I’d seen while running. I find myself time and time again, especially when the sky is clear, reaching up to click myself into darkness. I found this to be a similar experience to when I first started running without music. Dropping the music made me feel more in tune with my surroundings. Dropping the light took it to another level. It’s me and the morning. And it’s beautiful. It’s amazing how well our eyes adapt. And I don’t even really eat carrots. What I found is the headlamp gives me tunnel vision. Running w/o the light seems to open up the world around me. It’s hard to explain. But it’s cool. Dude – you’re crazy for running around, in the dark, with no headlamp. Eh. Not really. But I think safety is still critical. Given that, here are my tips for running into the darkness … should you decide to give it a whirl. Wear a headlamp. When I see a car coming, I click the light on so I’m more visible and then generally step off the road to let it pass. Wear lights on your back. Even though my headlamp is off, I have red flashing lights on my back. Nathan makes a cheap clip light. Get one. Wear reflective gear – that’s really a given whether your headlamp is on or off, if you’re running in the dark. I’m a big fan of the Amphipod xinglet. Run known routes. If you know where the pot holes are, it’s much easier to relax and enjoy the run vs. looking at the ground for something that’s going to twist your ankle. I don’t recommend trying this in the snow. It’s too hard to tell what’s good from a footing standpoint. Do you run in the dark? Ever tried to click the light out? This entry was posted in Training and tagged meteor, running, stars, training, ultrarunning on March 18, 2016 by darkskyrunner.